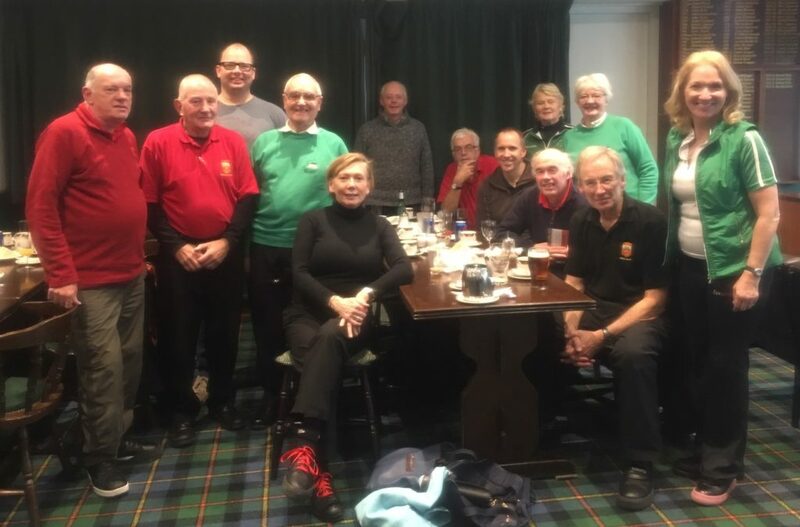 On Wednesday evening (5th December 2018) at Greenacres Curling Rink, two teams of Irish Curlers competed against Ardrossan Castle Curling Club in the annual match for the Belfast Medal. The contest is always looked forward to and was played in good spirit on lovely, keen, swinging ice. Team 1– Neil Fyfe (skip), Jim Winning, Carolyn Hibberd ,Margarita Sweeney- Baird settled quickly and maintained the lead throughout the game. Some spectacular shots from the skip left the opposition scratching their heads and wondering what they could possibly try next! Final score was 11-2. Team 2– Martin Sutherland (Skip), Christine Furey, Gilly Drury, Clare McCormick had a closer battle to begin with but after scoring 3 at the 3rd end, they settled into a winning streak. Never write off opposition skip Donny Shedden however, who had a chance of scoring 5 at the last end to even the game. Sighs of relief from the Irish as his attempt just failed. Final score was 8-4. Following the game, tea/ coffee and sandwiches were enjoyed by both squads and an enjoyable hour was spent in each other’s company. Thank you to the members who took part. We are looking forward to defending the trophy next year. We are hugely appreciative that Ardrossan Castle continue to contest this fixture – first played as far back as 1861 when the prize was a RCCC medal struck for the Belfast Curling Club. The medal was originally played for between Belfast Union and RCCC. The teams now contest the beautiful wooden trophy fashioned by Ardrossan curler Donnie Sheddon for the fixture. This friendly annual event, was revived by the ICA in 1994 but was first played in 1861. Originally we hoped to play it alternating between Irish and Scottish ice rinks, however we cannot provide ice time in Ireland at the moment. This annual competition format is for two teams from each club playing a single eight end game each and the aggregate score across the two rinks determines the winner.